Now you can walk in public without fear that someone will be taking your photos without your permission. 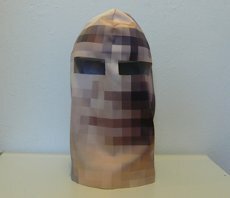 The full face mask Pixelhead acts as media camouflage, completely covering your head. It has two holes for your eyes so you can see and breathe comfortably while wearing it. Reform Party ready or not ready?